Several brain regions are believed to be important to encoding and storage of long-term declarative memories. These include structures in the medial temporal lobes, medial diencephalon, basal forebrain, and prefrontal cortex. In addition, certain subcortical nuclei and white matter pathways are important for retrieving acquired information from storage. The gross anatomy of the lateral and medial surfaces of the brain is illustrated in Figs. 6 and 7, whereas some of the more important structures related to memory are illustrated in Fig. 8. Figure 6 Lateral surface of the brain. From ''Structure of the Human Brain: A Photographic Atlas,'' 3rd ed. by S. J. DeArmond, M. M. Fusco, and M. M. Dewey, copyright 1974, 1976, 1989 by Oxford University Press, Inc. Used by permission of Oxford University Press, Inc. Figure 7 Medial surface of the brain. From "Structure of the Human Brain: A Photographic Atlas,'' 3rd ed. by S. J. DeArmond, M. M. Fusco, and M. M. Dewey, copyright 1974, 1976, 1989 by Oxford University Press, Inc. Used by permission of Oxford University Press, Inc.
disorder following brain surgery. H.M.'s surgery involved the removal of the medial portion of both temporal lobes, thus demonstrating the importance of this region to long-term memory functioning. Patients with bilateral medial temporal lobe dysfunction typically demonstrate a global anterograde memory deficit. Although short-term memory for newly presented information may be unaffected, these patients cannot encode information into long-term storage. On memory tests, they demonstrate poor recall and poor recognition of previously presented information. Patients with medial temporal lobe damage, however, demonstrate intact memory for information that had been acquired prior to their injury, semantic knowledge, and previously learned skills. They also demonstrate normal priming effects. Patients with bilateral medial temporal lobe dysfunction demonstrate global declarative memory deficits. The most common cause of this type of brain dysfunction is Alzheimer's disease, a progressive degenerative disorder in which neuropathological changes are first observed in the hippocampus. Other brain regions are affected as dementia progresses; however, the ability to form new episodic memories tends to remain the most significant behavioral symptom. Patients with focal brain diseases such as stroke or tumors may demonstrate unilateral temporal lobe dysfunction. In such cases, material-specific memory deficits may be observed. 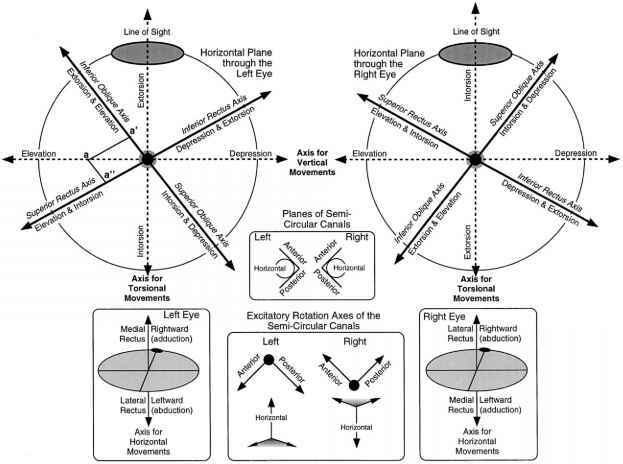 Patients with left temporal lobe damage typically have more difficulty learning and remembering verbal material, such as stories or word lists, than nonverbal material, such as abstract geometric patterns, faces, tonal patterns, or the spatial location of objects. Patients with right temporal lobe damage tend to demonstrate the opposite pattern of memory impairment. 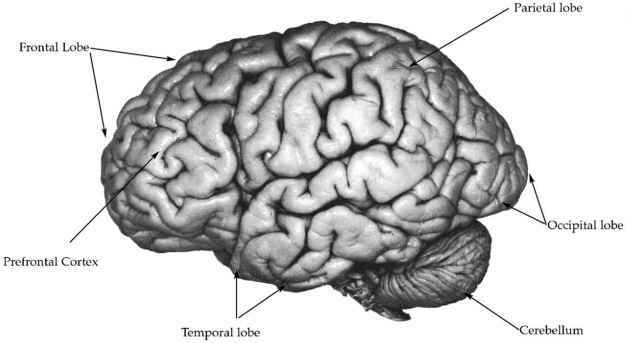 The temporal lobe is a relatively large brain region with several anatomically distinct areas. 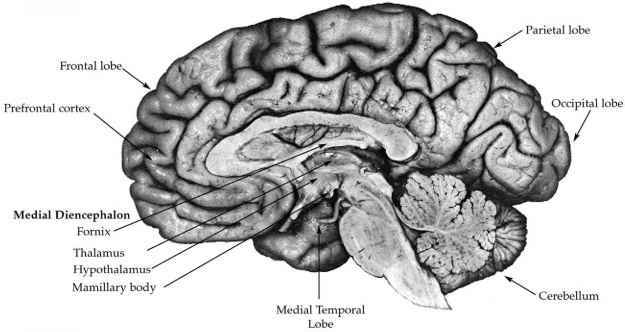 Most investigators agree, however, that the structures in the medial portion of the temporal lobes—specifically the hippocampus, its surrounding cortex, and the amygdala—are most important for memory (Figs. 8-10). 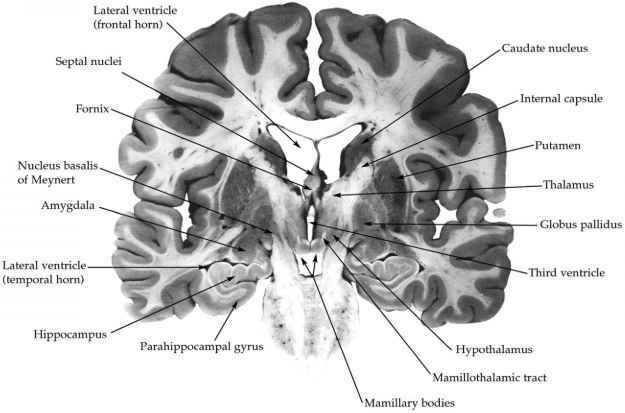 Figure 8 Coronal section of the brain at the level of the anterior portion of the temporal lobes illustrating many of the structures believed to be important to memory. From "Structure of the Human Brain: A Photographic Atlas,'' 3rd ed. by S. J. DeArmond, M. M. Fusco, and M. M. Dewey, copyright 1974, 1976, 1989 by Oxford University Press, Inc. Used by permission of Oxford University Press, Inc.
proper. The hippocampus curves inward again, forming the hippocampal fissure. 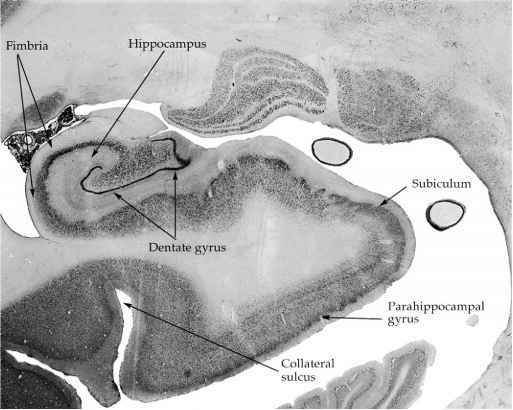 When the hippocampal fissure is opened, a narrow layer of cortex can be observed, known as the dentate gyrus. Axons arise from neurons comprising the hippocampus proper, converge to form the fimbria, and continue into the fornix, which is the major white matter tract out of the hippocampal formation. b. The Amygdala The amygdala is a collection of nuclei and specialized cortical areas situated in the dorsomedial portion of the temporal lobe rostral and dorsal to the tip of the temporal horn of the lateral ventricle (Fig. 8). Although early investigators believed the amygdala was primarily an olfactory structure, later studies revealed substantial inputs from brain regions responsible for processing many different types of sensory information, including visual, auditory, somatosensory, and autonomic stimuli. Outputs from the amygdala project to many brain regions believed to be important to memory, including the hippocampal formation, thalamus, hypothalamus, prefrontal cortex, basal forebrain, and corpus striatum. The amygdala is important to emotional, autonomic, reproductive, and feeding behaviors. Electrical stimulation of the amygdala in animals typically results in a constellation of aggressive and fear-related responses. Bilateral lesions to the amygdala in humans result in Kluver-Bucy syndrome, a disorder characterized by excessive docility, lack of fear response, hypersexuality, hyperorality, and changes in dietary habits. Figure 9 Illustration of a transverse section through the human hippocampal formation andparahippocampal gyrus. From "Structure of the Human Brain: A Photographic Atlas,'' 3rd ed. by S. J. DeArmond, M. M. Fusco, and M. M. Dewey, copyright 1974, 1976, 1989 by Oxford University Press, Inc. Used by permission of Oxford University Press, Inc.
fimbria, dentate gyrus, and subiculum, declarative memory impairment is less severe than when there is more radical loss of tissue. Similar findings have been observed in nonhuman primates. When the hippocampal formation and its adjacent cortical region are lesioned, less severe declarative memory disturbance is observed than when the amygdala and its adjacent cortices are also involved. The most severe deficit is observed when the hippocampus, its adjacent cortical region, and the cortical region adjacent to the amygdala (i.e., the entorhinal and perirhinal cortices) are damaged. Damage to the amygdala, however, does not create any greater declarative memory deficit beyond what is caused by damage to the other three brain regions. As discussed earlier, the amygdala is known to be important for processing sensory stimuli and information related to emotions. Studies show that the amygdala is important for remembering the emotional context of information. It is also implicated in certain types of nondeclarative memory, such as conditioning and evoking fear-related behaviors. The diencephalon is a region of several important nuclei located at the rostral part of the brain stem (Figs. 7 and 8). This region can be divided into four major areas: the epithalamus, thalamus, hypothalamus, and subthalamus. The divisions important to memory functioning include portions of the thalamus and hypothalamus. The thalamus is the largest subdivision of the diencephalon and is composed of several histopathologically distinct nuclei (Fig. 10). The hypothalamus lies below the thalamus and creates the floor of the third ventricle. It controls many autonomic, endocrine, and somatic functions and is composed of several distinct anatomical structures, including the mamillary bodies. Severe amnesia results from damage to regions along the midline of the thalamus and hypothalamus. Figure 10 Coronal section of the brain at the level of the midbrain illustrating the thalamic nuclei. From "Structure of the Human Brain: A Photographic Atlas,'' 3rded. by S. J. DeArmond, M. M. Fusco, andM. M. Dewey, copyright 1974,1976,1989 by Oxford University Press, Inc. Used by permission of Oxford University Press, Inc. There has been considerable controversy, however, concerning which of the many neuroanatomical structures and connections in this region must be damaged to cause memory dysfunction. 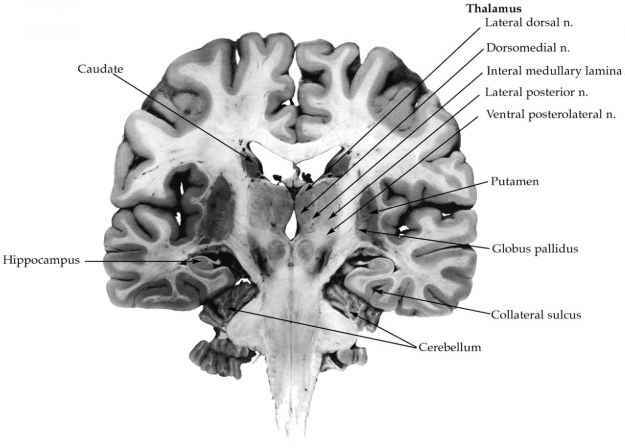 The structures that have most often been implicated in diencephalic amnesia are the dorsomedial nucleus of the thalamus, the mamil-lary bodies of the hypothalamus, and the white matter (mamillothalamic) tract connecting these structures. Patients who most commonly demonstrate diencephalic amnesia are individuals with Wernicke-Korsakoff syndrome. This disorder is caused by severe thiamine deficiency, often associated with chronic severe alcoholism. The first stage of this disorder involves an acute, global confusional state, oculomotor abnormalities, ataxia, and peripheral polyneuropathy. This stage is known as Wernicke's encephalopathy, during which the patient is in danger of suffering a potentially fatal midbrain hemorrhage unless treated immediately with thiamine. Approxi mately one-fourth of successfully treated patients regain the majority of their premorbid cognitive abilities. The remaining 75%, however, demonstrate severe, persistent anterograde and retrograde memory deficits. a. The Mamillary Bodies and Dorsomedial Nucleus The mamillary bodies and dorsomedial nucleus of the thalamus are both frequently damaged in Korsakoff syndrome. The few case studies in the literature of patients with naturally occurring lesions suggest that damage restricted to either the dorsome-dial nucleus or the mamillary bodies is capable of interfering with memory. In monkeys, lesions involving both the mamillary bodies and the dorsomedial thalamic nucleus result in memory deficits that are substantially more severe than those caused by lesions to either structure separately. Moreover, lesions to any single diencephalic structure appear to produce less memory impairment than lesions to the hippocampal formation. b. The Internal Medullary Lamina A series of studies using an animal model of alcoholic Korsakoff syndrome in rats suggested that damage to the internal medullary lamina may also be critical in diencephalic amnesia. Diencephalic damage induced in rats via an experimentally controlled thiamine deficiency caused bilateral lesions in the mamillary bodies, dorsomedial nucleus of the thalamus, and internal medullary lamina of the thalamus. Rats with radio frequency-induced lesions to the internal medullary lamina demonstrated more similarities to rats with thiamine deficiency on measures of spatial memory than to rats with lesions to the mamillary bodies or midline thalamic nuclei. Significant memory dysfunction has been associated with damage to the basal forebrain. The basal forebrain is a loose term used to describe the area of the brain superior to the optic chiasm. It includes the medial septal nuclei, nucleus accumbens, anterior hypothalamus, diagonal band of Broca, nucleus basalis of Meynert, and part of the prefrontal cortex (i.e., Brodmann's area 13). The structures within the basal forebrain project widely throughout the rest of the brain. The septal nuclei and nucleus basalis of Meynert (Fig. 8), for example, have extensive connections to and from the hippocampal formation, amygdala, and neocortex and are believed to be important to memory functioning. Basal forebrain involvement in memory functioning is implicated primarily from the study of two patient groups: patients with ruptured aneurysm of the anterior communicating artery and patients with dementia due to Alzheimer's disease. The basal forebrain is perfused primarily by branches of the anterior communicating artery; thus, disturbances within this flow of circulation result in infarction and necrosis of basal forebrain tissue. Patients with stroke, hemorrhage, or damage to this area subsequent to aneurysm surgery often demonstrate declarative memory deficits. Patients with Alzheimer's disease demonstrate marked degeneration within the basal forebrain as well as in the medial temporal lobes, as discussed earlier. The region of the basal forebrain most affected by Alzheimer's disease is the nucleus basalis of Meynert, a complex of neurons that produce the neurotransmitter acetylcholine. Recall that the ability to learn and remember new information reflects enhanced communication among neurons due to the development and growth of synapses. This growth occurs when neurotransmitters are in adequate supply. The primary neurotransmitter associated with the ability to encode and retain new declarative memories is acetylcholine. Thus, the depletion of acetylcholine in the brain caused by degeneration of neurons in the nucleus basalis of Meynert is believed to underlie part of the memory disorder associated with Alzheimer's disease. In monkeys, combined lesions to the nucleus basalis of Meynert, medial septal nuclei, and diagonal band of Broca result in significant memory impairment. 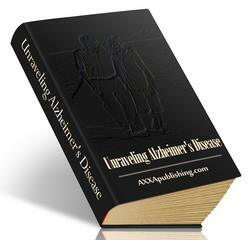 No significant memory impairment is noted, however, if each structure is lesioned separately. Thus, it appears that extensive damage to the basal forebrain, rather than specific damage to any given structure, is necessary to produce memory impairment. In light of these findings and the presence of extensive anatomical connections between the basal forebrain and medial temporal lobe structures, some have suggested that the basal forebrain most likely modulates medial temporal lobe memory processing but is not in and of itself a memory center. Functional neuroimaging studies have found that activity in the anterior region of the prefrontal cortex (Figs. 6 and 7) increases when one attempts to retrieve previously learned information. Specifically, the pre-frontal cortex is believed to play an important role in directing the attentional and organizational processes necessary for both encoding and retrieval of information. Disruption of these cognitive processes is associated with characteristic memory impairments, including source memory deficits, impaired temporal ordering, and confabulation. Source memory and temporal ordering refer to the ability to recall the spatial and temporal contexts within which information was originally acquired. Patients with prefrontal cortical damage may recall factual information correctly, but they often have difficulty recalling where they learned the information. If they learned several pieces of information over a period of time, they may recall all the information adequately but be unable to report which information was learned first. Another interesting behavioral consequence of prefrontal damage is the tendency to confabulate. When patients with prefrontal damage cannot recall factual information, they often fabricate false information rather than indicate that they do not remember the correct information. This is different from lying because these patients have no desire or intent to deceive. Confabulation is believed to be a manifestation of source memory and temporal ordering deficits, coupled with poor self-monitoring abilities. When spatial and temporal contexts of information are missing it becomes very difficult to select accurate recollections from all the possible information that can be retrieved in a memory search. Patients with prefrontal damage, it is argued, simply choose one of the many alternatives retrieved from memory. As illustrated in Figs. 8-10, two kinds of substances can be appreciated when the brain is cut—one light and one dark. The dark substance is known as gray matter and contains neuronal bodies, dendrites, and synapses. Gray matter covers the external surface of the brain (i.e., the cortex) and forms several discrete nuclei within the central portion of the brain (i.e., subcortical nuclei). The light substance separating the cortical and subcortical gray matter is known as white matter. White matter is made up of neuronal axons, the majority of which are covered in fatty sheaths known as myelin. It is the myelin that is responsible for the white appearance of these regions. Information is processed and encoded in gray matter, whereas the white matter pathways provide the means by which information is transferred and communicated throughout the brain. Research suggests that the ability to search and retrieve information from long-term memory stores is a function of subcortical nuclei and white matter systems. These data derive primarily from studies of patients with basal ganglia diseases, such as Parkinson's disease and Huntington's disease, and from studies of patients with white matter diseases, such as multiple sclerosis. These patients tend to be slower when processing and learning information, and they demonstrate poor free recall. Their recognition memory, however, is usually equivalent to that of healthy controls, indicating a primary retrieval deficit.